This armour is either closed cell or open-cell foam and in various densities all the way up to a fairly hard foam used in helmets. Hard foams absorb impact/shock by destructive decomposition so they can only be used to protect for one incident and must be replaced. Soft foams offer little protection with close-cell foams providing a bit more protection than open-cell foams. .
Of foam type armors, memory-foam armor achieves a higher level of impact absorption compared to open/closed-cell types above. Memory-foam rebounds slowly after compression. . It is a very dense foam. These are gel type impact/shock abosorbers. They are produced in various densities and generally used close to the body for comfort. Hard armour usually consists of a hard plastic and is designed to resist abrasive and puncture injuries. Hard armour generally is used in conjunction with some impact absorbing foam or other material on the inner surfaces facing the body. This is because hard armour by itself does not provide impact/shock abosorption qualities. 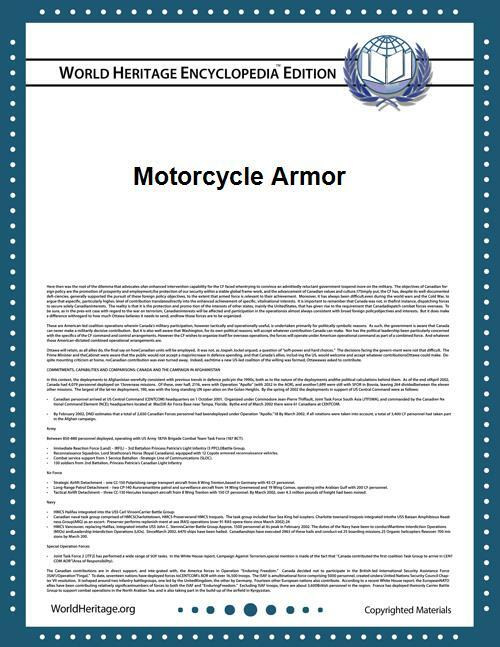 The use of viscoelastic materials in motorcycle armor has allowed for hand (glove) elbow, knee, shoulder, tail-bone, and back armor to be manufactured in a soft and pliable state at rest. Upon the introduction of shock the armor adopts extremely rigid and protective properties. Examples of this armor are SAS-TEC, d3o, Rukka APS air, EXO-TEC and TF armor. They are currently being used in jackets, trousers and suits by manufacturers such as REV'IT!, Firstgear, BMW Apparel, Scorpion, Rukka, Klim and Aerostich respectively. Viscoelastic armor is able to achieve a higher level of shock/impact reducing benefits with more comfort and less bulk then traditional hard armor - foam laminate solutions. Hybrid armor is layered with hard shell outer materials. European standard EN-1621 is used to rate the effectiveness of armor. In this standard a 5 kg flat impactor impacts the armor at a speed of 4.47 m/s (50 joules). 50 joules of force is roughly equivalent dropping a 5 pound weight from a 6 foot height onto the armor piece. Sensors measure how much energy is transmitted through the armor, its peak energy in kilo-newtons (kN), and its period (how long it took the energy to be transmitted). If the force transmitted through the armor is less than 35 kN then the armor (all armor except back) can attain an EN-1621-1 rating. Standard also includes other factors such as temperature stability and coverage area. The back protection standard is EN-1621-2. That standard rating is based on that energy being less than 18 kN (EN-1621-2 Level 1) or less than 9 kN (EN-1621-2 Level 2). EN1621-1 assesses armor designed to protect the shoulder, elbow and forearm, hip, tail-bone, knee and lower leg regions. The test apparatus consists of a mass of 5 kg with a 40 mm x 30 mm striking face, dropped onto the sample mounted on top of a 50 mm radius hemispherical dome. The anvil is further mounted onto a load cell, allowing a measurement to be made of the force transmitted through the protector. The kinetic energy of the falling mass at impact is required to be 50J. Serious spinal injures are usually caused by axial forces due to blows on the head, or bending and twisting forces on the back caused by blows to the shoulders, hips and other parts of the body. In the Cambridge Standard for Motorcyclists Clothing, Roderick Woods asserts that the majority of spinal injuries are caused by blows to the hip and shoulders. In the rare circumstance that a motorcyclist received a direct blow to the back the damage would be unmitigable by armor. The concept of a "back protector" is therefore not endorsed by Woods. Although back protectors, as defined in the standard, cannot protect against axial forces they are required to protect the scapula and there is now considerable anecdotal evidence that wearing a certified back protector can significantly reduce trauma in a major accident as they reduce the effect of impacts on the ribs and lessen the blows to internal organs too.